This is the one and only time that I know of so far in which I will skip a serial and move on to another. The episode Mission to the Unknown is an anomaly. It’s a one-shot episode that doesn’t star the Doctor and provides background for a serial that doesn’t happen until after The Myth Makers. I would have reviewed it first had there been any footage left. Alas, this is one of those missing episodes. I thought I would try to read the novelization for the one-shot but it’s mixed as a two-part adaptation with The Daleks’ Master Plan. When I attempted to start reading the Mission to the Unknown adaptation, it mentions Katarina, a companion that is introduced in The Myth Makers. With this in mind, I decided that the best option would be to skip Mission to the Unknown for now and push ahead to The Myth Makers. The Doctor and his companions find themselves in the middle of the Trojan War. A random Google search for The Myth Makers lead to a wonderful discovery. Some lovely person had cut and pasted the audio transcript of the series with the remaining footage of the episode. While it is nowhere near the level of reconstruction that has been seen in the professional BBC releases, it’s still nice to have something to view instead of nothing at all. I really wish that I had watched these installments before I had read the novelization. This was a vastly entertaining story. The characters were delightful and the overall story arc was intriguing. I even wished that the story just revolved around the Trojans instead of the Greeks merely because of the comedic exchanges between Paris and Cassandra. This was also an interesting serial because it felt as if this was the first time we see the Doctor face the consequences of history. With The Aztecs, the Doctor and his companions understand they are merely observers of history. In any of the historical episodes (Marco Polo, The Reign of Terror, The Crusades, The Romans and The Time Meddler), the Doctor may play a part in history but often it is within the sidelines or as the potential carefree participant. The Doctor’s companions often find themselves in the thick of the adventure, seeing first hand the various tragedies in history The Romans is a fine example of this when Barbara and Ian are sold into slavery while the Doctor and Vicki find themselves on a vacation with Nero. 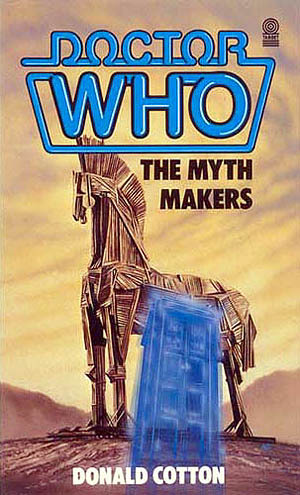 With The Myth Makers, the Doctor is forced to design and build the Trojan Horse. He is forced to face the slaughter of the Trojans by the Greeks. He is shocked and distressed by the entire affair. I can’t help but consider David Tenant’s tenure as the Doctor, specifically in the episode, The Fires of Pompeii. He is forced to play a vital part in history, setting in motion the deaths of thousands of Pomeii citizens. He’s devastated by his actions but they are necessary for the noble good. The Doctor faces the same dilemma in this episode, having been forced to concoct a plan to finally end the Trojan War. I don’t know if that was the intention of the writers but it works and it’s worth noting. This episode was a little heartbreaking as well because it features Vicki’s departure. Having appreciated Maureen O’Brien’s portrayal of the character, I was sad to see her character leave the TARDIS. But what a way to leave as a part of Greek Mythology/History; becoming Cressida and falling in love with Troilus. It’s a different interpretation to the myths and poetry produced about this era and it’s fun to watch. But when one companion’s departs, another companion enters. I’m still baffled by this idea of an introduction. In the last installment of this serial, jealous Cassandra assigns a handmaiden, Katarina, to watch over Vicki, spying on her movements. When the Greeks attack Troy, Katarina, follows Vicki towards the TARDIS. Katarina later finds Steven in the battle areas and brings him back to the Doctor. She ends up staying in the TARDIS, becoming a new companion as Vicki becomes Cressida permanently, choosing to stay for love; quite like Susan once did in The Dalek Invasion of Earth. The Myth Makers is a strange adaptation. This story took me a long time to finally finish because I just couldn’t get into the storyline. I attribute my lack of enthusiasm with this adaption to why it has taken me so long to update this site. (That and other life things) My one regret with this installment was that I found the fan reconstruction after I had finished the adaptation. I believe it would have been more helpful in pushing me to finish this story earlier than later. Now I know I don’t possess the knowledge to be an authentic Greek scholar outside of the magical world of Wikipedia, meaning I don’t know what types of plantations the Greeks might have had or if they hound-dogs or ‘possums, but this reads as if Homer is comparing Steven’s situation with one resembling some form of an American Southern comedy. It doesn’t fit with the setting of the story. The problem with this adaptation is that the author felt the need to have a narrator. There was no narrator in the original broadcast. Why was there one needed here? It’s a frustrating question because the author of this adaptation is the same author who wrote all four installments of this serial. The different shifts between story-lines (Greeks vs. Trojans) did not need a constant narrator to discuss the character’s actions or histories. There should have been a third person narrative, which would have worked out fine as it has in previous adaptations. I found myself ignoring or skimming the parts in which Homer was discussing his interpretation of the events. I was more engaged when the focus was on the characters of the story. The story itself, once you remove the Homer aspect of the tale, is quite engaging. This is one of those stories that I wish the full visual episodes were still available. I feel grateful for the fan audio reconstruction but it’s really not the same thing. In terms of the differences between the books and the visual broadcast, Steven is injured in the broadcast, which leads into the next episode. The ending of the book glosses over the battle sequences and Vicki’s departure. There is still great dialogue between the Trojan characters, but there is a minor focus on Helen and her role in the entire war/affair. There’s part of me that wishes that the book adaptation would merge with the visual broadcast to give the viewer a larger, overall vision of the Trojan War. It should be noted that Katarina is barely mentioned throughout the book until the end, similar to her introduction in the visual broadcast. Again, this is the part where I lament about missed opportunities. Both versions of the story have merits just as they have misses. Yet, they do complement each other. It would be in your best interest to watch/read them closely together.